The Akron Zips football (formerly Buchtel College and formerly nicknamed Zippers) team are a college football program representing the University of Akron in the Football Bowl Subdivision (FBS) of college football. Terry Bowden is currently the team's head coach. Akron plays its home games on InfoCision Stadium on the campus of the University of Akron in Akron, Ohio. The Zips compete in the Mid-American Conference as a member of the East Division. With a 507–524–36 record, Akron does not rank among the top 50 most victories among NCAA FBS programs. Akron was originally classified as a Small College school in the 1937 season until 1972. Akron received Division II classification in 1973, before becoming a Division I-AA program in 1980 and a Division I-A (now FBS) program in 1987. The Zips were the first team to move from Division I-AA to Division I-A. In 2005, the Zips won the Mid-American Conference championship for the first time in the program's history. The University of Akron football team was established in 1891 when the team, then called Buchtel College and the mascot as the Zippers, defeated Western Reserve University by a score of 22-6 in Hudson, Ohio. Buchtel went on to finish its first season with a 1–3 record. The following year, Buchtel hired Frank Cook as the school's first ever head coach. Cook lead Buchtel to a 3-4 record during his only season has head coach. In 1893, the college hired John Heisman to become the football and baseball coach. Heisman lead Buchtel to their first winning season with a 5-2 record in 1893, and then led them to their first undefeated season, albeit a single game season in which they defeated the Ohio State Buckeyes. While at Buchtel, Heisman also helped invent the snap, which is still used in modern-day football. The early years for Buchtel saw many coaching changes, as the program went through 9 different coaches in the 22-year span. Buchtel College changed its name to the University of Akron in 1913. Coach Fred Sefton served as the head football coach of the Zippers for nine seasons, from 1915 to 1923, compiling a record of 33–34–4. Sefton's teams posted winning records in five of Sefton's nine seasons, including four of his final five. Sefton resigned as head coach after the 1923 season. James W. Coleman was hired as Akron's head football coach after Sefton's resignation. His final record in two seasons with the Zippers is 6–10. George Babcock took over as head coach after Coleman's departure and led the Zips to a 5–2–2 record before departing to accept the head football coach position at Cincinnati. Red Blair was hired as the team's next head coach after Babcock's departure. In nine seasons at the helm of the Zips, Blair's teams compiled a record of 43–30–5. Blair's 1929 Akron team compiled a record of 9–1. His 1930 team went 7–1 and his 1935 team posted a 6–3 record for the best three years of Blair's tenure. Blair resigned as head coach of the Zips after the 1935 season. 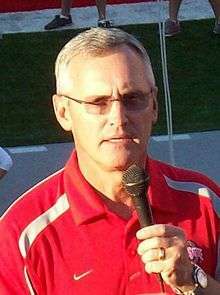 Jim Aiken was hired as the Zippers' head coach after Blair's resignation. Aiken's three seasons were all winning, as his teams compiled yearly records of 6–2–1, 7–2 and 6–3 for a grand total of 19–7–1. Aiken departed the Zips after the 1938 season to accept the head football coach position at Nevada. Thomas Dowler was hired to lead the Zippers football program after Aiken's departure. In two seasons as head coach, Dowler's teams compiled a record of 7–9–2. Otis Douglas took over the reins of the Akron football program after Dowler and his teams struggled. In two seasons, the Zippers posted a record of 5–10–3 that included a winless 0–7–2 mark in what turned out to be Douglas' final season. Akron did not field a football team from 1943-1945 due to the events surrounding World War II. Paul Baldacci was hired as Akron's head coach after the three season hiatus was over. 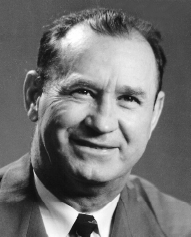 Baldacci served as head coach for two seasons, compiling a record of 7–10 that included yearly records of 5–4 and 2–6. Akron's on-the-field struggles continued during the tenure of Baldacci's successor, William Houghton, whose tenure produced a 7–27–1 record with no winning seasons or more than two wins in a single season. Under head coach Kenneth Cochrane, the Zippers broke out of their slump, posting yearly records of 2–6–1 and 6–3 before Cochrane stepped down to focus on his duties as athletics director at Akron. Cochrane shorted the school's athletic nickname from "Zippers" to "Zips". In 1961, the Zips hired Gordon Larson, who had been an assistant coach under Woody Hayes at Ohio State. Larson helped the Zips finish 2nd in the Ohio Athletic Conference 3 times in his first five seasons, going 26-8 in conference play during those five season. In 1966, the Zips left the Ohio Athletic Conference, and became an Independent football program. During its Independence era, the Zips put together the best run in school history, winning 38 games from 1968 to 1971, also going to the 1968 Grantland Rice Bowl. 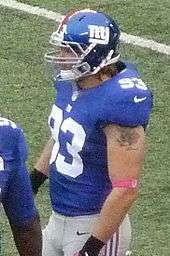 In 12 seasons, Larson had a record of 74-33-5. At the time of his retirement from coach, Larson was the all-time wins leader among head coaches in Akron football history. Larson remained at the university as the athletics director. In 1985 Akron president, William Muse replaced Dennison with former Notre Dame head coach Gerry Faust. Muse wanted the program to have "instant credibility" during its transition into a 1-A school in 1987. Adams and Muse felt that Faust was more prepared to lead the Zips as they transitioned into a 1-A institution. Faust struggled to get acclimated to the small budget school, struggling to a 25–23–2 start after his first 4 seasons with the Zips. Faust's Zips teams never won more than seven games in one season. Following a 1–10 finish in 1994, he was relieved of his coaching duties and became a fundraiser for the university. Faust's 43 wins placed him 3rd in Akron career wins leaders. The Zips became the first ever program to transition from 1-AA to 1-A when they made the move in 1987. J. D. Brookhart, previously offensive coordinator at Pittsburgh, became the 25th head coach of Akron on December 15, 2003, the program's third head coach since gaining Division I-A status in 1987. In his second season, he led the Zips to their first Mid-American Conference championship and their first bowl game in school history, the 2005 Motor City Bowl, which they lost, 38-31, to the Memphis. He was fired after the 2009 season, when the Zips went 3–9. Brookhart's final record at Akron is 30–42. In December 2009, Akron hired Rob Ianello, previously wide receivers coach at Notre Dame, as the Zips head football coach. He lost his first eleven games as a head coach before getting the victory over Buffalo in the final game of the 2010 season. His only other win as Akron's head football coach was a 36-13 defeat of VMI (a Football Championship Subdivision team) in 2011. Ianello was fired as Akron's head coach after just two seasons and a dismal 2–22 record. On September 14, 2013, Bowden lead Akron against the University of Michigan in Ann Arbor and came within a few yards of defeating the Wolverines, losing 28-24 after an incomplete pass from the Wolverines' 3-yard line on the final play of the game went out of the back of the end zone. Akron lead at various points during the game: 10-7 in the third quarter after a 28-yard passing touchdown from Kyle Pohl to Zach D'Orazio; and 24-21 in the fourth quarter after a one-yard pass from Pohl to Tyrell Goodman. Bowden's 2013 team showed improvement, compiling a 5–7 record on the season that included snapping the nation's longest road losing streak (28) with a 24-17 victory at Miami (OH). For the signs of improvement shown by the Zips, Akron extended Bowden's contract by two years through 2017. The Akron Zips football team played their first game in the stadium on October 5, 1940, getting their first win in the facility November 9 of that year. Prior to playing at the Rubber Bowl, the Zips football teams played at Buchtel Field, a 7,000-seat facility that opened in 1923. The Zips recorded their first sellout in the Rubber Bowl on September 30, 1961. In 1971, the university purchased the stadium for $1 from the city. An artificial surface was installed in 1983, which was replaced with AstroPlay in 2003. The Zips played 324 games at the stadium, which included their first-ever appearance on ESPN in 1986. Other notable games include the highest-scoring game in the stadium's history, a 65–62 victory over Eastern Michigan in 2001, as well as a 65–7 Akron victory over Howard University in 2003. In 2005, the Zips clinched their first Mid-American Conference East Division title and spot in the 2005 MAC Championship Game with a 35–3 win over arch-rival Kent State in that year's Wagon Wheel game. Akron would go on to win the 2005 MAC Championship with a last-second 31–30 win over Northern Illinois at Ford Field in Detroit. In 2003, the university began exploring the feasibility of building an on-campus stadium to replace the Rubber Bowl, which was in disrepair and several miles away from campus. In 2007, plans were announced for a new stadium, later known as InfoCision Stadium – Summa Field, with work beginning in January 2008 and opening in September 2009. The final Akron Zips football game at the Rubber Bowl took place on November 13, 2008 against the Buffalo Bulls. The game was nationally televised on ESPN and featured the two teams tied for first place in the Mid-American Conference's East Division with identical 5-4 (3-2) records entering the game. Buffalo defeated the Zips 43-40 in four overtimes in front of a crowd of 18,516. For the Zips, it was both the first four-overtime game and the first overtime loss in school history. After the game, a special ceremony with current and former players and coaches was held to honor the 68-year history of the stadium. Akron's biggest rival is Kent State University, located 10 miles (16 km) from the Akron campus. The two schools first met in 1923 and have played 56 times through the 2013 meeting. Akron went 11–0–1 in the first 12 meetings in the series between 1923 and 1941, with no games played from 1924–27 and 1937–39. Kent State started a 10-game winning streak in 1942 through 1954, though no games were played during the World War II years of 1943–45 when neither school fielded teams. After the 1954 meeting, the rivalry was scrapped due to a lack of competition. It was reinstated in 1972 and has been an annual contest since 1983. In 1992, Akron joined the MAC and the rivalry became a conference game. The Zips have played the Youngstown State University Penguins 35 times in football. They played for the Steel Tire, named for the products that both cities were known for. In 1995, the series was discontinued with Youngstown State holding a 19-14-2 edge. Below are Akron's record against its top ten most-played opponents in the Football Bowl Subdivision, Division I-A, or Division I, whatever the top division in college football was at the time. Akron has participated in two bowl games in its history, compiling a 1–1 record. Prior to 1987, however, the Zips were not a part of the Football Bowl Subdivision, formerly Division I–A. J. D. Brookhart arrived in 2004 and led the Zips to one bowl game in his six seasons as head coach, an automatic berth in the 2005 Motor City Bowl. One Zip have been inducted into the College Football Hall of Fame. As of July 2016, there are a total of 7 Zips listed on team rosters in the NFL, CFL, and AFL. The Akron Zips and Bowling Green Falcons compete at the Rubber Bowl on October 11, 2008. The Akron Zips as they play during their 2009 home opener at InfoCision Stadium, a 41-0 victory over Morgan State. 1 2 "InfoCision Stadium – Summa Field". GoZips.com. University of Akron. Retrieved April 25, 2013. ↑ The University of Akron Department of Athletics Brand Guide (PDF). 2015-07-01. Retrieved 2016-03-28. ↑ "2015 Football Bowl Subdivision Records - All-Time Team Won-Loss Records" (PDF). National Collegiate Athletic Association. Retrieved July 29, 2016. ↑ DeLassus, David. "Akron Historical Data". College Football Data Warehouse. Retrieved April 30, 2013. ↑ "University of Akron Athletics History". www.gozips.com. University of Akron. ↑ "MAC Report Online: 2005 Football Season Review". ↑ "2012 MAC Football Preview Part Five". www.theclevelandfa.com. TheClevelandFan, LLC. Retrieved May 9, 2013. 1 2 Matthew Balsinger (September 6, 2012). 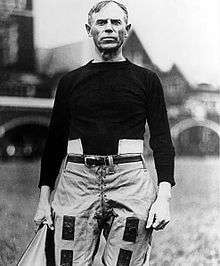 "John Heisman; an Akron legend". www.buchtelite.com. The Buchtelite. Retrieved May 9, 2013. ↑ "History : The University of Akron". uakron.edu. ↑ "Cincinnati Football History Database". nationalchamps.net. 1 2 3 "All-Time Coaching Records by Year". cfbdatawarehouse.com. ↑ "Eugene Register-Guard - Google News Archive Search". google.com. 1 2 "All-Time Coaching Records by Year". cfbdatawarehouse.com. ↑ "Athletics History & Traditions". University of Akron. Retrieved December 15, 2010. ↑ "Sarasota Herald-Tribune - Google News Archive Search". google.com. ↑ "Former Akron coach Gordan Larson dies". The Vindicator. June 14, 2005. Retrieved June 19, 2013. 1 2 "Beaver County Times - Google News Archive Search". google.com. ↑ "Walsh University's Jim Dennison to Retire". www.walsh.edu. Walsh University. November 12, 2012. Retrieved June 19, 2013. ↑ "History of FBS (I-A) vs. NCAA Division II/III & NAIA". footballgeography.com. ↑ "Schembechler: Akron President Should Be Fired". latimes. 1 2 Peter Alfano (April 4, 1986). "GERRY FAUST STARTS OVER WITH AKRON". www.nytimes.com. New York Times. Retrieved June 19, 2013. ↑ "Schembechler: Akron President Should Be Fired". www.latimes.com. Los Angeles Time. December 20, 1985. Retrieved June 19, 2013. ↑ Jere Longman (September 23, 1987). "The Rocky Road To The Big Time The University Of Akron's Unprecedented Move To Division I-a Has Not Been A Smooth One For The School Or For Coach Gerry Faust". www.aboutphilly.com. Retrieved June 19, 2013. ↑ "For Zips coach Lee owens the battle is won by the spirit". The Daily Collegian. ↑ "The Bryan Times - Google News Archive Search". google.com. ↑ "Toledo Blade - Google News Archive Search". google.com. ↑ "Akron Relieves J.D. Brookhart From Head Football Coaching Duties" (Press release). Akron Media Relations. 2009-11-28. Retrieved 2009-11-28. ↑ "Notre Dame assistant Rob Ianello will become Akron's coach". ESPN.com. ↑ "Akron Zips fires coach Rob Ianello after 2 seasons, 2 victories". ESPN.com. ↑ "Terry Bowden takes over at Akron". ESPN.com. Associated Press. December 28, 2011. Retrieved December 31, 2011. ↑ "Terry Bowden". College Football at Sports-Reference.com. ↑ "No. 11 Michigan survives scare, denies Akron's last-second upset bid". ESPN.com. ↑ "Akron knocks Toledo down". Toledo Blade. ↑ Bryan M Vance. "Akron vs. Miami (Ohio): The Zips Snap 28-Game FBS Losing Streak In 24-17 Victory Over RedHawks". Hustle Belt. ↑ Dan Wolken, USA TODAY Sports (21 November 2013). "Akron gives Terry Bowden two-year contract extension". USA TODAY. 1 2 Biliczky, Carol (January 30, 2013). "Rubber Bowl's history dotted with highs, lows". Akron Beacon Journal. Retrieved February 24, 2013. ↑ Associated Press (November 13, 2008). "Starks rips off three TDs as Buffalo drops Akron in four-hour, 4OT marathon". ESPN.com. Retrieved February 24, 2013. 1 2 "UA Unveils New Athletics Branding Marks". www.uakron.edu. University of Akron. July 1, 2002. Retrieved June 5, 2013. ↑ Tom Hardesty (November 1, 2012). "Wagon Wheel battle holds its own place among rivalries". www.recordpub.net. Record Publishing Co, LLC. Retrieved June 5, 2013. 1 2 "Football Hosts Akron in Battle for the Wagon Wheel". www.kentstatesports.com. Kent State University. 2004. Retrieved June 5, 2013. 1 2 3 "2012 University of Akron Football Media Guide". www.gozips.com. University of Akron Athletic Department. Retrieved May 8, 2013. ↑ David DeLassus. "Youngstown St. vs Akron (OH)". www.cfbdatawarehouse.com. College Football Data Warehouse. Retrieved June 5, 2013. ↑ "Akron Zips Head-to-Head Results". Sports-Reference.com. Retrieved 10 December 2013. ↑ 2013 Akron Zips football media guide. Retrieved 2013-Oct-13. ↑ "Akron Zips Football Coaches". www.gozips.com. University of Akron. Retrieved April 26, 2013. ↑ DeLassus, David. "Akron Championships". College Football Data Warehouse. Retrieved May 22, 2013. ↑ "Akron Zips Index". www.sports-reference.com. USA TODAY Sports Digital Properties. Retrieved May 14, 2013. ↑ "J.D. Brookhart Coaching Record". www.sports-reference.com. USA Today Sports Digital Properties. Retrieved May 14, 2013. ↑ 2013 Akron Football Information Guide. Akron, OH: University of Akron Athletics Department. 2013. Retrieved August 1, 2013. ↑ "Akron's Smith Receives Another Honor". www.mac-sports.com. Mid-American Conferences. November 27, 2000. Retrieved August 1, 2013. ↑ "John Heisman". www.footballfoundation.org. The National Football Foundation and College Hall of Fame, inc. Retrieved April 26, 2013. ↑ "University of Akron Varsity "A" Sports Hall of Fame Members". www.gozips.com. University of Akron Athletics Department. Retrieved May 9, 2013. ↑ "Akron Drafted Players/Alumni". www.pro-football-reference.com. USA Today Sports Digital Properties. Retrieved April 29, 2013. ↑ "NFL Players by College - A". www.espn.com. ESPN. Retrieved July 5, 2016. ↑ "Active Players". www.cfl.ca. Canadian Football League. Retrieved July 5, 2016. ↑ "AFL Players". www.arenafan.com. ArenaFan. Retrieved July 5, 2016. ↑ "Daron Alcorn". www.arenafan.com. ArenaFan. Retrieved May 24, 2013. ↑ "Andre Jones". www.arenafan.com. ArenaFan. Retrieved May 24, 2013. 1 2 "Jason Taylor NFL Football Statistics". www.Pro-Football-Reference.com. USA Today Sports Digital Properties. Retrieved April 29, 2013. ↑ "Akron Drafted Players/Alumni". www.Pro-Football-Reference.com. USA Today Sports Digital Properties. Retrieved April 10, 2013. ↑ Richard Rosenblatt (April 27, 1993). "Mr. Irrelevant of 1993 title goes to Mr. Alcorn of Akron". Gainesville Sun. Retrieved May 23, 2013. ↑ "Akron Zips Football Schedules and Future Schedules". fbschedules.com. Retrieved 2016-09-27.